Canadians and the world are desperate for the Canada we once knew. The Canada that was a global role model on environmental issues and the Canada that often chose the moral high ground even when it was not politically palatable. It is not too late for leadership. In the lead up to the next round of UN climate talks, instead of taking responsibility for their own pollution problem, the Canadian Government is focusing on a full scale public relations and diplomatic campaign to ensure no door is closed to Canada's highly polluting tar sands. The cost of this campaign goes beyond taxpayers dollars -- the real cost is our international credibility, and even worse a safe climate and future for Canadians and the world. Over recent weeks we have been inundated with dire warnings about climate change and the dangers of our addiction to fossil fuels. We have heard from the International Energy Agency that we are perilously close to locking ourselves into a world where runaway global warming will become inevitable. Just last week we heard from the Intergovernmental Panel on Climate Change that, among other things, extreme heat waves are expected to increase tenfold by the end of the century. The science is undeniably clear -- our window to avoid the worst is closing and it is closing fast. Not surprisingly, many countries have recognized the urgency of this problem and are making efforts to clean up their own acts through reducing emissions and investing in clean energy as well as preparing and supporting the world's most vulnerable regions for what is to come. Not the Government of Canada. The Canadian government's record on climate change is well known. We hear about it, at the very least every year when Canada is awarded yet another 'Colossal Fossil of the Year' for being the most counter-productive country at the UN climate talks. We know that the government has slashed funding for environmental science and renewable energy incentives. We know they abandoned their Kyoto commitments and were the only country to return from Copenhagen and weaken their emissions reductions target. We know they muzzle their climate scientists and bury critical data on our greenhouse gas pollution. And we know that Canada's federal energy and climate change positions revolve predominately around the reckless expansion of the fastest growing source of greenhouse gas pollution in the country -- the tar sands. As you read this, European member states are preparing to vote on the implementation of their groundbreaking policy, the Fuel Quality Directive. This policy would see Europe encourage the use of cleaner fuels. One dimension of this policy is that it includes specific values for certain types of highly polluting fuels, including oil from tar sands. Not just Canadian tar sands, all tar sands deposits around the world. Despite the global application of the policy, Canada is the only country from outside of the European Union to intervene, and their interventions were not insignificant. This aggressive lobby campaign included over 110 meetings and millions of dollars in taxpayer money over the course of 2009 and 2010. As the proposed December vote approaches, member states of the European Union have been subjected to yet another round of aggressive lobbying from the Canadian Government. Unfortunately the Fuel Quality Directive is only one of a handful of policies under attack by Canada. As doors close on Canada's highly polluting tar sands oil, most recently with the debilitating delay of the Keystone XL pipeline, the government's reaction has been overtly defensive. 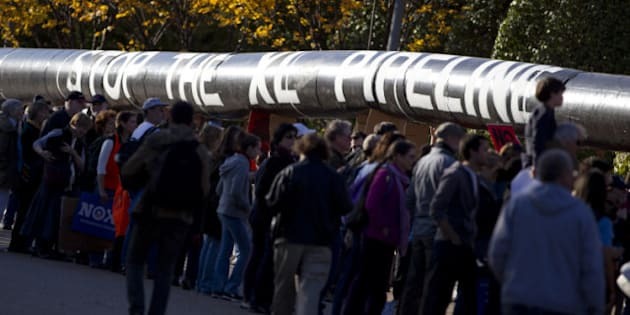 They have equated different perspectives on the Keystone pipeline from the official opposition in Canada to treason, they have threatened trade consequences behind closed doors in Europe, and they have desperately clung to the oh-so-ironic 'ethical oil' brand that has been ridiculed by many, not the least of whom are recipients of the Nobel Peace Prize. The tar sands have a serious pollution problem. By the government's own data, tar sands are projected to account for over 100 per cent of emissions growth in Canada over the coming decade, and despite multiple promises, there is still not a single federal regulation to address tar sand's greenhouse gas emissions. Until the Government of Canada understands that they have a pollution problem that will never be solved with public relations or diplomacy, they are going to be fighting a losing battle. If the government is going to put so much energy into fighting, it would be great if it was fighting against climate change, instead of protesting clean energy and climate policies abroad. Canadians want our climate and energy policy to be defined by reducing our pollution instead of increasing it and we hope the government arrives at the same conclusion sooner rather than later. With the Durban climate talks fast approaching, wouldn't it be great if this were the moment when Canada became a good guy again?